The SPA Explosion Proof pendant control station is the most rugged pendant station available for use in heavy industries in potentially explosive environments. The double row of operators allow for a large number of functions in a single enclosure. With an IP66 rating, and suitable for ambient temperatures from -50C to +55C (-58°F to 131°F), the SPA Explosion Proof can handle whatever environment you require push button controls. 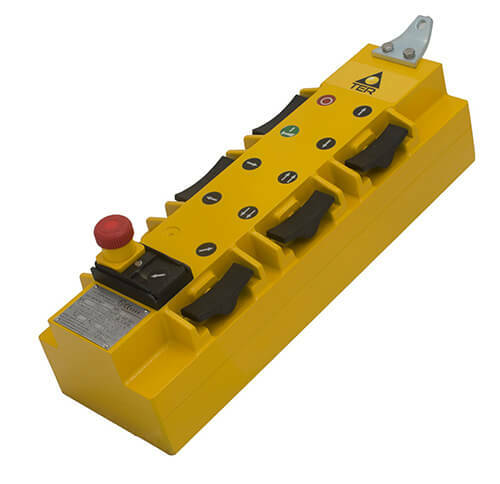 Available in configurations from 2-12 operators, each operator can be fitted with one or two speed switches, using normally open (NO) or normally closed (NC) contacts. The mechanical life of the switches is 1million operations ensuring a long useful life.